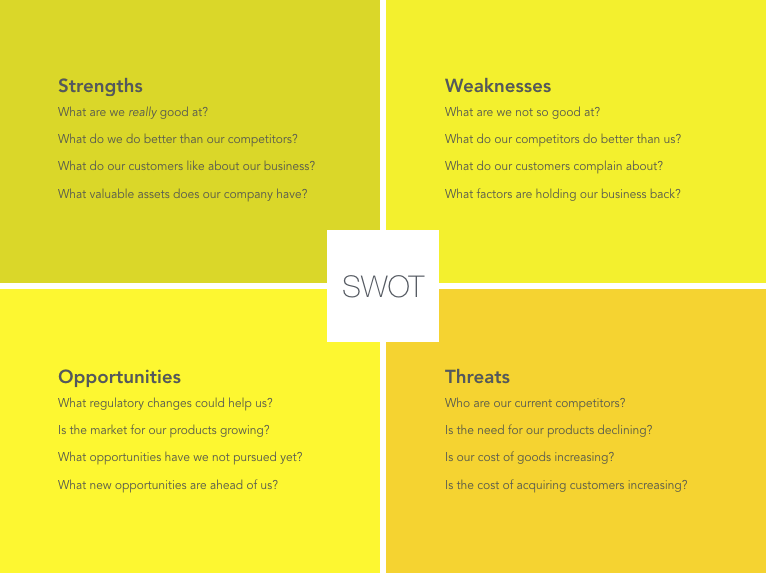 How To Use SWOT Analysis To Examine Your Business — Stratomic. When you’re in your business every day, it’s often hard to take a step back and look at the bigger picture. However, not looking at the broader landscape can cause serious or even fatal problems for your business. Unexpected competitors enter the market and outmaneuver you. Your main competitors steal your customers by targeting your weaknesses. They decimate your unique selling points and value proposition, turning them into your weaknesses – meaning that you’re no longer selling on strength, but drawing attention to your weaknesses versus your competitors. You miss opportunities to attack your weaknesses and unlock growth. And you miss new opportunities and markets to enter. Therefore, it’s essential to spend time working on your business. One of the best tools for this is the SWOT analysis – it will push you to look at the potential of your business. With this framework, you won’t just examine how your business is performing today, you’ll also analyse how it might to perform in the future – in the context of the market. A SWOT analysis examines the good, the bad and the ugly things going on in your business – from both an internal and external perspective. SWOT stands for Strengths, Weaknesses, Opportunities, and Threats. Strengths and Weaknesses are internal factors, which mostly focus on the present and are under your control – i.e. what is happening in your business. Opportunities and Threats are external and focus on the future, but are mostly outside of your control – i.e. what could happen. As a result, the process of completing a SWOT analysis is far from scientific. It relies on your ability to observe and identify internal and external factors that have – or might – impact your business. It’s about understanding what to consider and plan for as your business moves forward. 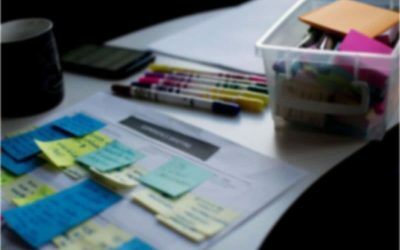 While most business decisions will be made by senior management, completing a SWOT analysis needs a wider view of the business. Including your employees in the process can give you a more complete picture of your business. Your employees will look at the business’s successes, failures, opportunities, and challenges from a unique perspective. Including them will also gain greater buy-in on the strategic decisions you take after finishing the project. In larger organisations, it may not be practical to bring everyone together – but that should not mean you don’t gather feedback from across your organisation. I highly recommend conducting surveys to gather feedback from your employees. Following that, I recommend taking survey results into departmental brainstorming sessions before scaling up into an organisation-wide brainstorming session. In the organisation-wide session, you’ll review the output of the departmental sessions and begin brainstorming from there. Once you’ve exhausted everyone’s ideas and feedback, you should have four long lists that cover your strengths, weaknesses, opportunities, and threats. At this point, you need to qualify and rank every item in terms of relevance and importance. This should be done by the senior management team. Ask everyone in the group to organise their top five items in each of the four categories. Some patterns will hopefully start to emerge – this is where you should focus. One key step that most businesses don’t take is to validate their findings with customers. This needs to be done with finesse so that you don’t end up causing alarm – the questions you need to ask are different to those that you’d ask your employees. A mixture of qualitative and quantitative research gives the best results. Now that you’ve completed your long-lists and validated your findings with customers, you’re ready to start the process of focusing. Work on narrowing down your lists so that they will fit onto a single page – similar items can be grouped. The best way to narrow your lists is to focus on the impact an item could have on your business, and on how likely it is to happen. For example, high staff turnover would be both a weakness and a threat – especially if your brightest talent leaves. You’re in a vulnerable position, even if you’re sure you’ve done everything you can to retain your best talent. Conversely, even if you’re not worried about a few of your clients being responsible for a significant portion of your revenue, you need to consider what might happen if they all decided to leave. Once you’ve created your one-page SWOT, don’t get rid of the unabridged lists. 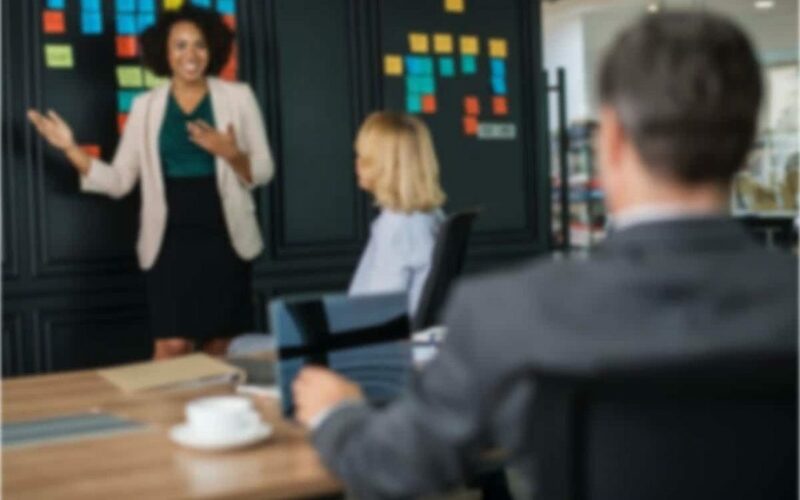 They’re useful for future reference and you should be aware of what’s on there to ensure you don’t miss any important issues – especially as the business environment evolves. Your list is only as good as the strategies that you develop off the back of the analysis. 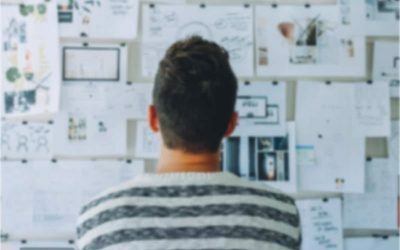 The SWOT helps you to understand where your business is today, and where it could be tomorrow, but without action, there’s no chance you will move the needle. Thus, you must develop strategies that capitalise on the opportunities and take advantage of the strengths you’ve listed. Conversely, you should deal with the weaknesses and threats. Be mindful of the fact that different factors can work together to balance each other out. Consider how your strengths can improve your weaknesses. And how you can use opportunities to neutralise threats to your business. How can you leverage your strengths to make the opportunities ahead even bigger? Are there weaknesses that you need to focus on to neutralise a threat? To start with, the strategies you create don’t need to be complicated – you’re trying to define a broad direction and plan of action. I highly recommend using the Strategyzer business model canvas. It’s a great way to visualise your business. But you should be thinking about how you can develop this analysis and the strategies that come from it into a more robust business plan. This merely serves as a segway to thinking about how you can develop this analysis and the strategies that come from it into a more robust and detailed business plan. It’s important that you don’t forget this final step as it will bring you back to the realities of running your business. Do you need funding to capitalise on the opportunities ahead? That’s going to need a business plan. Do you need to start thinking about how you restructure your business? That’s also going to need a business plan. Are you going to develop a different marketing strategy to target a different segment of the audience? The only way to deliver an effective marketing plan is to integrate it into the business plan.